Gparted 0.16.2 has been released with important bug fixes and language translation updates. Here’s how to install or upgrade in Ubuntu 13.04 Raring, Ubuntu 12.04 Precise and Linux Mint 13 Maya, 15 Olivia. 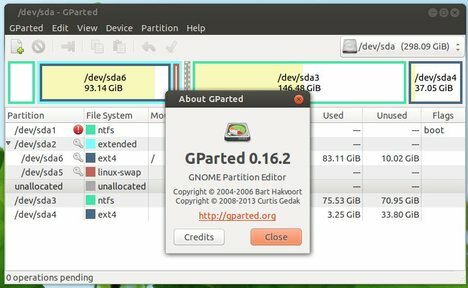 GParted is a GTK+ front-end to GNU Parted and the official GNOME Partition Editor application besides Disks. It’s available in Ubuntu Software Center, but old. The GetDeb repository contains the latest packages for Ubuntu 13.04 Raring, Ubuntu 12.04 Precise and their derivatives. First click the link below to download the getdeb package, then double-click to install it via pop-up Ubuntu Software Center. It will add getdeb repository to your system. Then, run below command in terminal to update and install it. Or you can use Synaptic Package Manager to upgrade the Gparted if you have it installed. Thanks a lot for sharing this terminal command.